You must have done a lot of work researching, applying and interviewing for jobs for months. When you receive a job offer you might be confused about how to accept a job offer in the right away. After all the process is being over, you are now offered with a job offer which can be provided in many ways such as through email, phone or verbally. Accepting the job offer in one of these ways has their own beneficial factors. There are a number of aspects to be focused on while accepting a job offer in any of the above-mentioned ways. 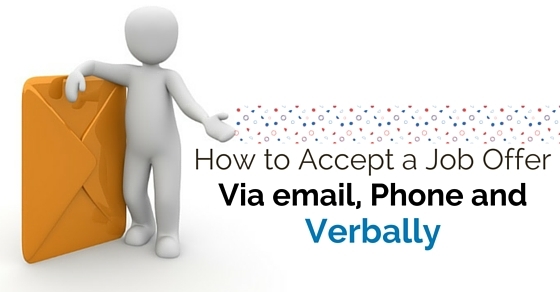 Let’s get in detail about how to accept a job offer through email, phone and verbally. How to Accept a Job Offer via Email? Emails are the quickest way by which job offers are intimated or sent. Once an email is sent and the candidate accepts it, then the employer moves forward with other steps in the job process. The employee can read through a number of samples and get to know the format of writing an email. The candidate should know how to accept a job offer via email and few aspects regarding it. The hiring manager is the one who makes the decision and the offer letter is sent to the candidate through email by the recruiter or human resource staff. When a job offer is sent via email the candidate must remember to review the offer letter first. Reviewing is important as the candidate needs to understand the position being hired for, benefits, and salary and start date. The letter would also have the time mentioned to respond to the offer. If you have any concerns, then you can raise the same to the recruiter or the one who prepared the offer letter. After reviewing, when there are no negotiations with the job offer, then formulate an acceptance email letter for the offer which initiates with an appreciation. Never forget to mention “thank you for the offer to join Xyz Company as a programmer I appreciate the assurance you possess on my qualification and look forward to a long and productive bond”. Appreciate the job offer once you receive an email. When you receive a job offer via email which mentions conditions such as background checks, drug test, and more then formulate your email in a confident manner mentioning that you would get through all the tests. Make a confirmation of the email by mentioning the position, salary, department, and start date of the job role. For example, this is a written acceptance of job offer which you extended on August 3, 2015. I accept the offer to become a programmer with an annual salary of $ 80,000. I will report on the first day to the human resources department, August 13, 2015. Hence confirming the email is yet another important aspect in accepting a job offer via email. In the closing paragraph about the organization make sure to present your eagerness to join the organization. If you possess references and have not provided earlier, you can do so, in the same manner, you can answer questions which you have been asked earlier by the employee, which you have not answered. The acceptance letter can be sent to your hiring manager and a copy can be saved for your reference. If return receipt facility is available in your email, you can ask for an acknowledgement. An acceptance job mail is a good idea but it is equally important to keep the acceptance mail up the heat, brief and in a professional manner. The acceptance mail should be drafted with a gratitude which should be drafted after the negotiation process. A job offer via email can be accepted only if the role is the one you desire and it meets all the needs of the organization. The job role should also be the one that syncs with your desired job description. Once you have accepted the job offer, thank the employer through an acceptance email. Also remember to ask the employer for a job offer in writing format. The job offer letter would possess all details such as name of the organization, position, start date, benefits and salary details. Almost all applicants would be waiting to hear through a call about their recruitment result. The hiring manager calls the candidate first and then makes the offer through a letter. Verbal confirmation is something important and makes the candidate confirm that they are offered with a job. Let’s address few ways for accepting job offer over the phone. It is good to accept job offer through phone as the first step where the acceptance can be by calling the hiring manager or by receiving a call from the organization. If you have called your hiring manager to inform about your acceptance regarding the job offer, remember not to leave a voice message. If the hiring manager isn’t present send a voice message stating that you need to talk to him. Once a candidate receives an offer through phone he would be excited and enthusiastic. Make the hiring manager or the recruiter that you’re appreciative about the offer. Do not make the gratitude too thick and mention how pleased you feel for being chosen as an appropriate candidate for the job and mention thanks. Once the recruiter has mentioned about the job offer via phone, the candidate can ask the recruiter any queries regarding joining the job. The steps to be taken to join the job, details regarding a written offer letter, date and time details about when to visit the office, and lot more queries can be asked by the candidate. The terms and conditions of the offer can be clarified by the employee. The employee after appreciation can enquire about the complete compensation package, leave policies and lot more. Verify that you are being offered the right duties and responsibilities that you have applied for. By this kind of verification you can avoid unpleasant surprises in future. If the employee has any queries regarding travel requirements, work hours, chain of commands, and other specifications regarding the position, then the employee should make sure that he clarifies it well before accepting. Give the hiring manager a tentative acceptance that you have clarified your queries and satisfied. Also remember to ask the hiring manager about when you will receive a written offer letter about all that was discussed over phone. Mention the hiring manager over phone that you would receive the letter, read it and sign it as an acceptance in a formal manner. Conclude the conversation by mentioning “again, thank you for your confidence in my skills. I would be waiting for a written offer from your concern, in case I have any queries I would call you to clear my doubts before I send my response through writing”. In your conversation ask your recruiter if they have a specific date to confirm your response and end the call. Once you have heard about your job offer in a verbal manner you should know what you’re agreeing before you accept the job offer. When you say yes it means that you accept all the terms and conditions and hence agree only when you’re sure about taking the job. There are many ways to say thanks to the hirer after the interview. When you’re offered a job offer in a verbal way it is necessary to thank the hirer as the first duty. Convey that you’re excited and passionate about working in their organization. While at a verbal conversation clarify all the terms and conditions including important details such as the compensation, your branch of work, leave policies and more. Verify and ensure that the job offered go with the duties and responsibilities as descried earlier, check whether you are recruited for the offer you attended the interview. By this way you can avoid any surprises in future. If there are questions regarding travel, work hours, and other specifications regarding the job role, can be clarified during the verbal communication. Ask all the questions before accepting the job offer and give your acceptance. Ask the hiring manager about the written format of the offer letter with all the details that you have discussed. Assure the hirer that you would sign the written offer letter and submit her in a formal manner as a sign of acceptance. Handshakes and verbal acceptances are aspects that make social and cultural binding. It is always a good choice to accept the job offer in both verbal and written manner. The candidate should look into few aspects while accepting the job offer. The candidate should find out if the job role would be apt for him in the long term plan. If the opportunities are perfect for him and would lead to progression. If the salary package is appropriate for his role. Whatever may be the mode of message, a written job offer with all the terms and conditions signed by both the employer and the candidate is always good. There are many organizations which mention that salary is negotiable and you can open negotiations if required. In that manner make an open request and start negotiating your salary while in a verbal communication. You can mention the specific sum or the range within which your job role salary should be. Research well and discuss the topic which would offer you with more ideas. Be cool, though the offer may lead you to burst out with excitement its important as excitements can lead you to hasty decisions. The employers would mention in glowing terms about their happiness in adding you to their team. They have already decided that you would be a great addition to the team and hence they would enjoy adding you to their team. Remember not to be carried away. Once you are offered with a job offer, though you may have a negotiation process make sure to ask for time so that you provide your official answer. By this way you can gain time to discuss with your friends, relatives and family. You also get time to research about the position, job role and salary being provided. Take time, research and then accept the job offer. An agreement is mandatory in many organizations hence the employee should make sure to clarify terms regarding the agreement and other conditions that need to be signed. All signing and acceptance should be done after negotiation process. Once the employee is clear with all the terms, conditions and more, the employee can accept and sign the acceptance for job offer. A job offer can be offered via email, phone or verbally and hence candidates should know the way it should be accepted. The above-mentioned tips are useful for candidates who are waiting for their job offer. The job offer in any mode must be accepted by the candidate in a professional and perfect manner. The candidate must make all the clarification and read through the terms and conditions before signing the job contract. Also make sure that the written job offer has all details such as date of offer, new job title, start date, start salary, holiday entitlement and hours of work, probationary period if any and period of contract end. The candidate can also research the web and get to know more details regarding how to accept job offer via email, verbal and phone.